The preparations are all done. We’ve sent the cards, just in time to catch the last posting dates. An online grocery delivery is scheduled for 23 December. Christmas gifts are on their way or already delivered, courtesy of Amazon. The tree went up yesterday. Carols have been sung. We’re streaming Mariah Carey on YouTube. We had snow last week, and the lonely stump of a snowman still lingers in our garden. Love Actually and the The Lego Movie are lined up for Christmas TV viewing. And may I take this opportunity to wish you all the best this Christmas and for the New Year! we just got our first big snowfall today. The grocery stores will be jammed packed tomorrow, and I will be right in there with the crowds. Snow will change to rain, but not for long. I think we’ll have a white Christmas. Best wishes to you and yours. I like your snowman a lot! You finished off the year in style. Have a happy new year, too. I may be a little late, but Merry Christmas, my friend! Thank you for all the Christmas wishes! In return I can wish you a Happy New Year! 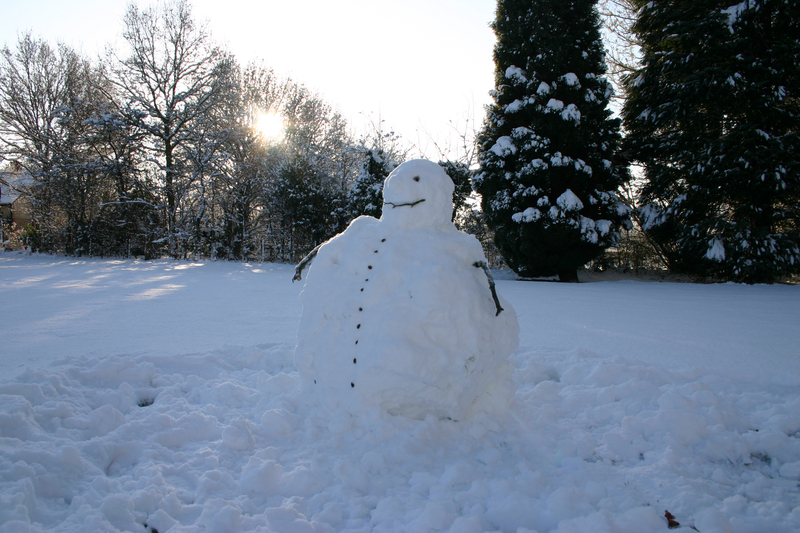 That looks like one very happy snowman who plans to stick around for a while. We’re breaking records with the heat here in Tucson (in the 80s F, 26 C) and I don’t think he’d last too long in the Old Pueblo.